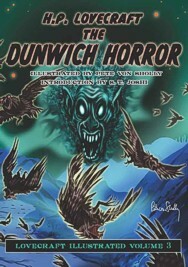 The Dunwich Horror is the story that hooked me on Lovecraft. The mystery of the Whateleys and their ways, the character of Wilbur and the stunning revelation of his true self, the verisimilitude of the setting and all the trappings work so well. It was in this tale that I learned about Miskatonic University, the standing stones crowning many lonely New England hilltops, the eerie truth about whippoorwills, and [of] course the Necronomicon of the Mad Arab, Abdul Alhazred. The Dunwich Horror. By H.P. Lovecraft, illustrated by Pete Von Sholly, introduction by S.T. Joshi. Hornsea, England: PS Publishing; 2014; ISBN 978-1-848637-33-7; jacketed hardcover.